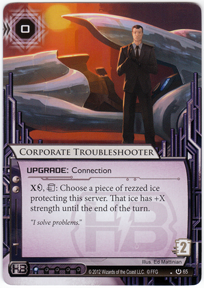 A new set is coming out, and with it, Second Thoughts brings us a potentially powerful new Corp card. (Well, actually, there are a number of interesting cards. But for now, there is one card in particular that I want to discuss). I am talking, of course, about Restructuring. Restructuring is a powerful corp economy card with a catch: it requires you to jump through the hoop of getting up to $10 in order to play it. A common analysis of this card is: “While it’s great in some decks like Weyland that are rich, my <NBN/Jinteki> deck is poor, so I can’t use it”. “Atman is great in decks that have Datasuckers, but my deck doesn’t have datasuckers, so I would have to play other breakers as well, and would run out of memory, so I can’t use it”. “Scorched Earth is a great way to kill the runner, but my Weyland deck had no way to tag the runner, so I can’t use it”. Essentially these analyses are saying that there deck is in a state of local maxima, and that adding only the particular card to the deck, would make it worse. That’s a valid point. Those decks probably wouldn’t want to only add those cards into their deck, and change nothing else. But therein lies the challenge of deck building. Sometimes, in order to accommodate a powerful card, you have to change more than one thing about your deck. Essentially, you have to build up a new deck, making a number of changes, and then evaluate the new whole against the previous deck. You have to get away from the local maxima, and try to see if there is a better, stronger deck, somewhere else in the deck construction space. Perhaps we will find, through testing, that our original NBN deck was better all along. Perhaps we will find that our newly restructured deck is superior. When a card is powerful, when it has high potential, it’s worth trying to build around, to jump through hoops for. Maybe you’ll end up with something that doesn’t work. But maybe you’ll end up with a deck that uses only Atman as an icebreaker, and win GenCon. Of course, it doesn’t always work out. Sometimes we think a card has a lot of potential, like Underworld Contacts. And we put all these link cards in our deck in order to activate it. We even added in Access to Gloabalsec! And the end result is…well, not terrible, but lets just say that the grand total of Underworld Contacts used in 1st place Plugged in Tour decklists is a big zero. Which result will we find when we test Restructuring? When we put it in our non-Weyland decks and try to get enough money to play it? Without testing, we can’t really know, but I suspect that it will end up being quite strong, and we will see a lot of corp decks focused heavily around burst economy cards. Alright, so we want to try restructuring. How must we change our corp deck in order to accommodate it. First of all, we need to have ways to reliably reach $10, early in the game. Our goal is to get to $10, restructure up to $15, and then spend the money usefully. What cards can help us? This is #0, not #1, because it’s super obvious. The BaBW and GRNDL IDs obviously do a great job of letting you restructure. Everyone is already going to be easily throwing Restructuring into these decks. Now that that’s out of the way, let’s get on to other corporations, where things are less clear. Play Celebrity Gift with a full hand, and you have $10. Play the Restructuring you just showed them, and you’re at $15. Plenty of money to rez the Tollbooth on HQ so that they can’t get in and take those Astroscripts you just told them you have in your hand. You say your Jinteki deck can’t get to $10, that it’s always too poor? I think that’s a bit unreasonable. Celebrity Gift is a good card! It makes Restructuring better, and Restructuring makes it better. Add Hedge Fund and you’ve got most of a strong economy already right there. Of course, Celebrity Gift costs a lot of influence, so you can’t fit it into every deck. Also, it has a drawback, it reveals your hand. Hey look, now you have TWO build-around type cards! This is like a puzzle, you should go work on it. Hint: what works well with both? Jackson Howard. Play Hedge Fund and you are only $1 away from Restructuring. Easy! 3) Low cost ice and economy ice. At the beginning of the game, getting to $10 for many IDs is going to be a process. When you aren’t Weyland, it might take you a bit. This is especially true if you are having to rez ice to defend yourself. If you are spending all your time rezzing ice, taking you to $0, and then building up again to rez another piece of ice or advance an agenda, you won’t be playing a restructuring any time soon. This is the situation many people describe when they say “my corp is too poor to play it”. But if we rez several pieces of early game ice that cost $1 or less, or even give us money, then this is a lot less of a problem. Rezzing a Caduceus and successfully tracing to get $3 back, rezzing Ice Wall for $1, gaining a bonus credit off Popup Window, rezzing a Chum for $1 and having the runner jack out before you have to rez what’s behind it – these all help us maintain our early money and reach our $10 target. Activating a Melange will put us at least most of the way to being able to play Restructuring. 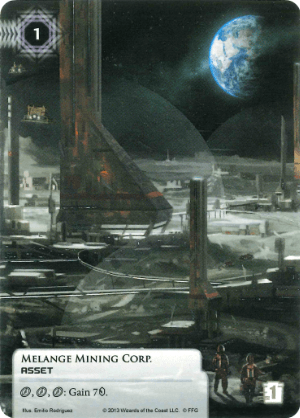 A nice scenario for the corp might be managing to activate a Melange, having the runner pay money to run through ice and kill it, and then just playing Restructuring to get even more money, even though the Melange got killed. 5) Adonis Campaign, Green Level Clearance, Beanstalk Royalties. These are kind of the Honorable mentions for helping us play Restructuring. They don’t do it right away/by themselves, but they can get us part of the way there, or in the case of Adonis, can get us there 4 turns from now, if we can keep it alive. 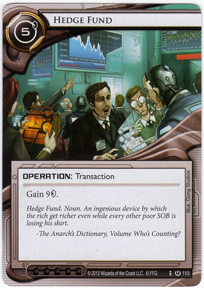 Finally, the economy cards that are the least helpful in getting us to $10 quickly are slower/long term things like Eve Campaign, Pad Campaign, or Marked Accounts. While these can help us get there eventually, they don’t exactly combo with Restructuring. So Restructuring mostly wants to be combined with other burst economy cards, and with cheap ice or economy ice. Good to know. Alright, so we have $15 now, what do we do? We have already seen that we want plenty of low cost or economy ice for our Restructure deck, so that rezzing ice won’t prevent us from reaching $10. Now that we played a Restructuring, we have a lot of money, and we could afford some big ice like Tollbooth, Hadrian’s Wall, etc! Alternately, our deck might contain almost entirely small ice. This would help ensure that we have small ice early. We would need to find some other effective use for our Restructure money. Another good way to blow a ton of money to win the game, if we have more money than the runner, and they make a run, we can blow them up with SEA Source + Scorches. The classic Weyland kill, it’s good in NBN as well. Heck, it’s great in Jinteki too, where you probably only need a single Scorch after they suffer some net damage. Maybe we don’t ever pay for big ice. We get rich, the runner runs through our Popup and Ice Wall and finds an agenda. Now we blow all that money on a Midseason Replacements. Having achieved infinite tags, we win with Psycho/Beale or Scorched Earth or something. Maybe we spend the money to rez some SanSan City Grids and push agendas through them. Maybe we spend it on Biotic Labors. Maybe both. Fast advance decks tend to have plenty of money right before they fast advance, because fast advancing is expensive. What that means is, when you had plenty of money, you could play a Restructuring, and then you’ll be able to afford even more fast advancing. Another outlet for our riches could be to simply Brute Force an agenda through using a card that lets us spend ‘X’ to make it so the runner simply can’t get to our agenda. This is classic, Core Set, brute forcing, pushing through a Priority Requisition with a Troubleshooted Archer, or by pumping enough into an Ash trace that they can’t get access it. Restructuring is a great addition to this type of strategy. 1) Be cheap very early on, and have plenty of ways to quickly burst yourself up to $10. 3) Have outlets to convert your piles of money into a win in some way. Try it out! Build decks using this principle, play them, and compare the results to your current decks. (Again, I’m talking about non-Weyland decks here. Weyland is easy, you just throw it in, and we all know that). I suspect that we are going to find that Restructuring is generally a very strong card. In the future, I think we will see that most top-8 tournament decks are playing it, even excluding the Weyland decks (which probably all use it). So is Restructuring better than Hedge Fund? Would a 15/21 version be even better? And a 20/27 version better still? No, let’s not go crazy. Hedge Fund is the best, because its ‘hoop’ that you must jump through to gain the bonus $1 over Beanstalk Royalties is easy to achieve. In fact, on turn 1 of the game, you have already achieved it. Hedge Fund is just really amazing at helping you defend early on and not be unable to rez needed ice. Restructuring is harder. You can’t just automatically play it from your starting hand (this is where someone comments about how you can in GRNDL). Instead, it’s an actual hoop you have to jump through. The compensation is nice however, a bonus $1. More importantly, playing a deck with 3 Hedge Fund and 3 Restructuring is kind of like playing a deck with 6 Hedge Funds. In any game in which you were able to play Restructuring within a reasonable time frame, it was an excellent card. Restructuring is more niche than Hedge Fund. It’s less automatic. It requires being built around, just a bit. But it’s probably worth it. For most decks, and most strategies. You tweak your deck somewhat to be able to accommodate its requirements, and you probably get a stronger result. Here is an example decklist using Restructuring in an NBN deck. 3 Tollbooth (the ‘plenty of cheap ice, with some expensive ice’ plan. Defend with cheap stuff early. Then try to score a Priority Requisition behind a tollbooth after you Restructure). This deck isn’t really focused on one particular plan, it has a combination of all of them, a number of different ways to win. It’s kind of a jack-of-all trades deck, which can be both a strength (more outs/harder to counter), but also a weakness (not as strong at its plan as a very focused deck). Maybe you want to make a more focused version. This list probably isn’t optimal. Maybe more burst economy is needed in order to use restructuring. Maybe there are too many different expensive ‘money outlets’. Maybe it does better if you add in drip economy in addition, like Marked Accounts. It’s up to you what you want to try, but whatever you try, I would recommend testing out Restructuring in it. The potential is too good to simply ignore.